After spending much of her life as a corporate executive and business owner, Maddie Margarita chose to enter the “real” world. It was here, caring for her mother and inspired by their mutual love of books, where she re-discovered her passion for fiction. It was her almost primal need to connect with people and make them laugh that drove her to write novels. 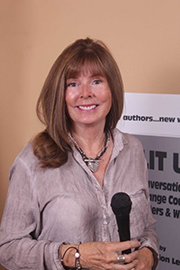 Margarita has lived in Tucson, New York and Miami, and currently resides in Southern California with her husband, where she is busy shopping her romantic suspense novel, and writing its sequel along with humorous urban fantasy. When not writing, Margarita is traveling, speaking, and producing Lit Up! Orange County, a monthly author event that has showcased the work of over eighty-five Southern California writers. She belongs to Sisters in Crime, OC Writers, and serves on the Board of the Southern California Writer’s Association as Chief Talent Wrangler and Events Chair.